calibre, a free and open-source e-book computer software application suite which runs on multiple platforms, allows users to manage e-book collections as well as to create, edit, and read e-books. It supports a variety of formats (including the common Amazon Kindle and EPUB formats), e-book syncing with a variety of e-book readers, and conversion (within DRM restrictions) from different e-book and non-e-book formats. Kovid Goyal started developing libprs500 on 31 October 2006, when the Sony PRS-500 was introduced. The main idea was to enable the use of the PRS-500 on Linux. Goyal, with support from the MobileRead forums, reverse engineered the proprietary file format LRF. In 2008, the program's name was changed to calibre, written in lowercase even at the beginning of a sentence. 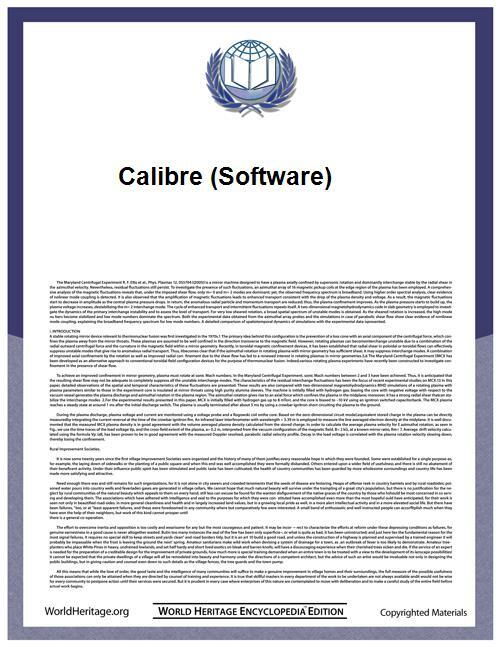 calibre supports many file formats and reading devices. Most e-book formats can be edited, for example, by changing the font or font size and by adding an auto-generated table of contents. Conversion and editing are easily applied to appropriately licensed digital books, but commercially purchased e-books may need to have digital rights management (DRM) restrictions removed. calibre does not natively support DRM removal, but may permit DRM removal after the installation of plug-ins with that functionality. calibre helps to organize one's personal e-book library by allowing the user to sort and group e-books by metadata fields. Metadata can be pulled from many different sources (e.g., ISBNdb.com; online booksellers; and providers of free e-books and periodicals in the US and elsewhere, such as the Internet Archive, Munsey's, and Project Gutenberg; and social networking sites for readers, such as Goodreads and LibraryThing). It is possible to search the calibre library by author, title or keyword, though as of May 2011 full-text search had not yet been implemented. E-books can be imported into the calibre library, either by adding files manually or by syncing an e-book reading device. Online content-sources can be harvested and converted to e-books. This conversion is facilitated by so-called "recipes", short programs written in a Python-based domain-specific language. 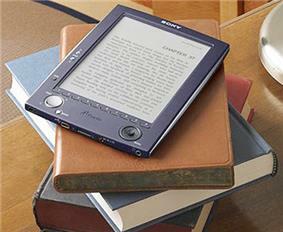 E-books can then be exported to all supported reading devices via USB, the integrated mail server, or wirelessly. Mailing e-books enables, for example, sending personal documents to the Amazon Kindle family of e-book readers and tablets. The content of the library can be remotely accessed by a web browser, if the hosting computer is running. In this case, pushing harvested content from content sources is supported on a regular interval ("subscription"). 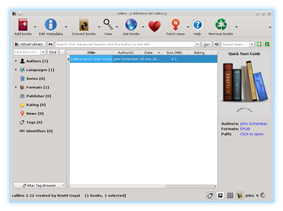 Since version 1.15, released in December 2013, calibre also contains an application for creating and editing e-books directly, similar to the more full-featured Sigil application, but without that application's WYSIWYG editing mode. At every launch, calibre connects to calibre-ebook.com, in order to check for updates. This phone home behavior cannot be disabled, per Kovid Goyal's request. Calibre Cloud and Calibre Cloud Pro, free and paid apps, respectively, by Intrepid Logic that let you "access your Calibre e-book library from anywhere in the world. Place your calibre library in your Dropbox, Box, or Google Drive folder, and be able to view, search, and download from your library anywhere". This tool can be used to "create [one's] own Cloud of eBooks". Calibre Companion, a paid app by MultiPie, Ltd., recommended by calibre's developers, that "brings complete integration with calibre on your desktop, giving you total control over book management on your device." Calibre Library, a paid app by Tony Maro that allows one to "Connect wirelessly to your Calibre e-book library or other Stanza source. Browse and download your e-books on the go." Calibre Sync, a free app by Seng Jea Lee that "seamlessly connects to your Calibre Library and shows up as a connected device on Calibre. If Auto-Connect option is enabled, your device will attempt to connect to the Calibre Library when it is within the home Wi-Fi network. This allows Calibre to automatically update your device with the latest newspaper or magazines you have scheduled for download!" Leger Calibre and Leger Calibre Donate, free and paid apps, respectively, by J.A. Escobar that provide a browsable interface for calibre libraries saved on an SD card. ^ Goyal, Kovid (2014-11-28). "calibre - What's new". Retrieved 2014-11-28. ^ "Mobileread Forums". mobileread.com. Retrieved 14 July 2012. ^ "calibre - About". Calibre-ebook.com. 2006-10-31. Retrieved 2013-07-29. ^ Sorrel, Charlie. "How To Strip DRM from Kindle E-Books and Others". ^ "User named kovidgoyal on fulltext search in TODO list". 2010-08-01. ^ "User named Kovid Goyal (kovid) on fulltext search request". 2011-05-23. ^ Intrepid Logic. "Calibre Cloud". Google Play. Retrieved June 2014. ^ Jane. "Create Your Own Cloud of Ebooks with Calibre + Calibre OPDS...". Dear Author. Retrieved June 2014. ^ MultiPie, Ltd. "Calibre Companion". Google Play. Retrieved August 2013. ^ John Jermey (September 30, 2012). "Calibre Tools For Your Android Device". Teleread. ^ Tony Maro. "Calibre Library description". Google Play. Retrieved August 2013. ^ Seng Jea Lee. "Calibre Sync". Google Play. Retrieved August 2013. ^ J.A. Escobar. "Leger Calibre". Google Play. Retrieved August 2013. Official blog "calibre tips and tricks"
"Calibre". MobileRead Forums > E-Book Software. Roy, Lachlan (2012). Managing Your eBooks With Calibre.